In the 80’s and 90’s David Hudson coined the acronym ORMEs. This is a name for what he defined as a new state of matter. ORMEs is an acronym for “Orbitally Rearranged Monatomic Elements” . He demonstrated, through his very detailed experiments and multiple testing, that at least 13 of the transition elements (Co, Ni, Cu, Ru, Rh, Pd Ag, Re, Os, Ir, Pt, Au, Hg. ), which are in the center of the periodic table, can exist in a heretofore-unidentified state of matter. He claimed that this occurs when they are in a monatomic state. At this stage the outer electrons of these elements form cooper pairs and become whirlwinds of light rotating at super speeds around the atom. Again, as a result of this change they lose all conventional chemical reactivity. Another important change that takes place is that the whirling electrons that have become light set up a Meissner antimagnetic field. This antimagnetic field causes a levitating force against the earth magnetic field and the element effectively loses 4/9’s of its weight. According to Hudson, at this same time the nucleus becomes high spin and shrinks to about 1/3 of its original size and distorts to an oblong shape. When in this state as a single atom it should be a very small and very chemically inert atomic gas. The gold bead in Photo 1 is about 500 microns in diameter and the string of beads in Photo 2 range from 10 to 50 microns in diameter. (Photos 1 and 2) The report on this will be given later in this paper. The March 03, 1999 sample was saved, because it also had a small amount of blue Ormus in the glass portion of the sample. It was stored in a sealed polyethylene plastic bag, (Photo 3). This piece of glass was melted and attached to a fused piece of magnetite. The gold appears to be growing on the opposite side of the magnetite, about ½ inch away from the small spot of blue Ormus glass. A very significant addition to this sample is a small duplication for this gold growing event, where another an even smaller spot of blue Ormus glass is found and about ¼ inch away a few small spots of gold are also growing. This is not basal growth but tip growth. It is theorized that the gold comes from the surrounding air. The sample was stored in a sealed plastic bag. Apparently the small gold atoms diffuse through the bag and then were attracted to the magnetite substrate by the energy field set up by the Ormus at the base to react to form metallic gold. For some reason not fully understood the Ormus gold is converted to metallic gold as the atoms touch the surface of the magnetite. It could be the increased magnetic field surrounding the magnetite or the ability that magnetite has to either give up or receive electrons, alone or in combination with the special energy field sent up from the Ormus gold below in the glass. I live in Albuquerque, NM near the Sandia Mountains. For the past 10 years I have been hiking up the mountain trails near the tram where there is a service road to the first service tower. The hike to the tower is about 1 ½ miles long where you climb about 400 feet in elevation above the parking lot at the tram home base. In the past few years and more especially in the past 6 months I have observed that there is a significant amount of white coating on many of the rocks along and beside the trail. 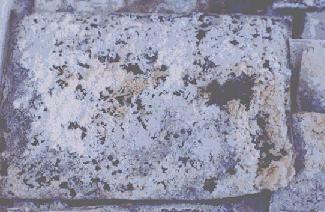 Many call this substance “Caliche” a presumed calcium carbonated material. At first I thought this white material was deposited from underground hot spring deposits, but there are no hot spring around nor have there ever been. In most all cases the boulders and pebbles are free standing on the surface and not attached to bedrocks. Also these rocks are mostly round and have the coating on two to four sides. I believe that the atmosphere is the source of the white powder and that it grows on rocks, to which it is attracted, by some force within the rocks. I presume that this force comes from the Ormus glass in the lava rocks that cause such heavy coatings and that the other variety of rocks like the granites, sandstone’s, etc. must have a paramagnetic like nature that causes the attraction. The coating material comes from the air and even more so when there is a light rain like we get here in the desert. The rain captures the Ormes on the way down and deposits them on the rocks where some of it is attracted to stay. If there is not too much or too heavy of a rain it does not wash away and after drying up it hardens into a permanent coating of white powder. A set of experiments are being started to explore and try to understand what is going on in this coating process. About 6 months ago, I started drinking what I call magnetic water as a means of energizing my body. After a month or so, an unusual effect started to show up. A friend of mine Bob S first noticed it. I had introduced him to the methods of making magnetic water and he under took an experiment and then went a little further with it than I did. He processed his water for about 5 days and was drinking 3 cups a day, while I was only processing it for 2 to 3 days. He reported to me that his hair was turning dark, especially in the back of his head near the neckline. As time went on, this effect spread upward and moved more toward the front of the head. Now after about 6 month his hair is about 95 % darker in the back and about 80% darker on the sides and front, and his beard about 50% darker. At that time, which was about 3 months ago, I started watching my own hair. Before I started drinking what I call “magnetic water” my hair was about 90% gray, and the hair on my beard and mustache was 100% gray. I did not know the effect this energized water could have on one’s hair, so I was not watching for it the first few months I was drinking the water. So, when I did first notice it, the hair on the back of my head had already turned about 30% darker. I have now upgraded my processing facility, which makes it possible for me to have “5-day water”. Five-day water is defined as water that remains in the magnetic activation apparatus for a minimum of 5 days. Previous to that I was only using 2 to 3-day water. My wife and I now drink a minimum of 3 cups of this water a day and probably closer 5 to 6 cups. What is very unusual about these changes is that the whole length of the hair changes at once from gray to dark. It doesn’t just start at the root and grow out, but the whole length of the hair turns darker at once. You may have heard stories about people who have experienced a terrible shock in their life and their hair turns white overnight. Well, I believe this magnetic water has the reverse effect on a person, but to a much smaller degree – it occurs slower. It takes months to see the effect, but the positive effect is there and is real. You might say that this is a poor man’s fountain of youth. The apparatus for making this water is very simple. It consists of using an empty cylinder shape container, like a large oatmeal container, that is about 5 inches in diameter. At the center, an 8-inch long length of a 3-inch diameter mailing tube is placed. In the space between the inner walls of the 5-inch diameter can and the 3-inch diameter mailing tube, the black magnetite sand is poured. This makes a cylinder of magnetite about 1 inch thick surrounding the 3-inch diameter hole in the center. Into this hole a standard bottle of spring water is placed that is about 710 ml in size – this is about one-pint of water. It fits in very nicely. You put together a minimum of five of these units and allow the process to proceed. Then after five days, you take one bottle out everyday and drink the water and replace it with another. This gives the water 5 days in these units for magnetic activation. The units should be placed at least 6 inches apart to get maximum concentration of the Earth’s magnetic fields. What I think is happening is that the magnetite, which is a strong magnetic susceptor is concentrating the earth’s magnetic fields into it’s cylindrical shape and the shape effect in turn sets up a magnetic spiral vortex in the core of the cylinder in which the water is stored. This in turn activates the water with this magnetic energy. I think this is the activating force for regeneration changes in our bodies as we drink it. The hair color restoration is the first sign of this regeneration happening. A second sign is that the fingernails are growing faster and stronger and the skin in spots seams to be getting smoother and softer with less skin tags. A secondary effect is dental improvement. My friend Bob S. needed to go to the dentist to have two molars crowned followed by two root canals. He had been drinking the water for about two months before going to the dentist. The dentist had told him that he was going to have to do two root canals at $475.00 each before he could do the crowns. When the dentist removed the old fillings he was surprised because he said that where the hole in the root was supposed to be, the molars had filled in calcified! He couldn’t believe it! He said he had never seen anything like it. Bob S. was really happy because he saved $950.00! No root canal needed!!! Another important improvement in the mouth is how it improves the gums. Before I started drinking magnetic water my dental hygienist would measure gum pockets in the 4 to 6 range and my wife’s was 5 to 7 range. In six months while drinking the magnetite water the my pockets dropped to the 3 to 5 range and my wife’s to the 4 to 6 range then after nine months my pocket dropped to the 2 to 3 range and my wife to the 3 to 5 range now after a year my pockets are all gone, tight gums and my wife’s is in the 2 to 4 range. Also, my gums no longer bleed during brushing. I started a friend of mine on this magnetic water about 3 months ago. To his surprise after a week of taking this water he finally realized that he had stop smoking. He just forgot that he was a smoker and no longer had any desire to do so. He says that for the past 11 years he had been trying to stop but he couldn’t do it. Now it just happened on it own as if he never was a smoker. As of this writing – 3 months into the program – he has not started again. This in turn brings into the water the special magnetic energies that come with the Ormus atoms. This special energy in turn is food for the soul or spiritual component of man. I believe as many others do that all permanent healing and regeneration first takes place in the spirit and then manifests into the body. So energizing the spirit makes sense. The crystal structure of magnetite is unique and most likely is responsible for these effects. Magnetite is Fe3O4 and it has a basic cubic crystal structure. It manifests as an octahedron structure that looks like two pyramids base-to-base  Sacred geometry? 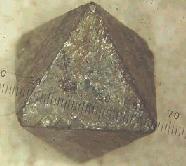 We see this same octahedron structure in the crystals of the magnetite as it becomes manifested in the clustered water. This then becomes another point or means of energy transfer to the water because both the magnetite and the clustered water have the same basic structure or geometric energy resonance. How convenient! 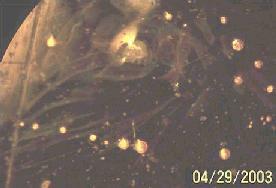 This is just what we want to happen, and it does when we place the water in our magnetite generators. – Improved spiritual effect i.e. intuition and creativity. We have magnetite for sale. We recommend a starter kit of 50 pounds @ $5 per pound, that’s $250 plus $1 per pound for S&H that’s $50, total $300. This will make 6 units using about 8 pounds per unit. We sell a 25 pounds can for $175 including S&H. 10 pounds for $100 including S&H. 5 pounds for $60 including S&H.  TECHNICAL OVERVIEW ( “Written for the layman by a layman”  David Hudson  Cotton Farmer ) – David Hudson spent 8.7 million dollars learning this “Advanced Science”. – Silver http://www.hbci.com/~wenonah/hydro/ag.htm , and the “light platinum group” ( palladium http://www.chemicalelements.com/elements/pd.html , rhodium http://www.chemicalelements.com/elements/rh.html , and ruthenium http://www.chemicalelements.com/elements/ru.html ). These are called 3d transition group elements. – Gold http://www.chemicalelements.com/elements/au.html , and the “heavy platinum group” ( platinum http://www.chemicalelements.com/elements/pt.html , iridium http://www.chemicalelements.com/elements/ir.html , and osmium http://www.chemicalelements.com/elements/os.html ). These are called 4d transition, group elements. – Copper http://www.hbci.com/~wenonah/hydro/cu.htm , cobalt http://www.hbci.com/~wenonah/hydro/co.htm and nickel http://www.hbci.com/~wenonah/hydro/ni.htm . These are called 2d transition group elements. These elements are known as “transition group elements”. They are in an uncertain state as regards their positive or negative electro-charge behavior, hence the name “transition”. Their valence. electron orbitals are always half filled or half empty. (Electrons in the outer shells of an atom are referred to as valence electrons. Different orbital states for electrons can hold only certain numbers of electrons. ) Elements with fewer electrons in the outer shells tend to be electro-positive, and those with more electrons in the outer shells tend to be electro-negative. Most atoms cluster in groups of at least two or more atoms. However, the transition group elements, because of their unique properties, can be found already existing, or can be created and are able to remain, in a stable single atom state. This is achieved by having no nearest neighbor closer than four angstroms and, therefore, by not being able to chemically bind with other atoms. This is called a “monoatomic” state. In this state, these atoms interact in two dimensions, in a unique continuous linear movement between a strong repulsive force when close enough to each other, and a strong attractive force when moved apart at a certain distance. Only when the repulsive force is overcome, will these atoms aggregate to form a metallic union. In metals, during the process of going from a many atom state to a monoatomic state, there is a disaggregation of the metal-metal bonds and a loss of the properties characteristically assigned to the description of a metal. Different transition elements have different critical atom cluster size which determine their metal characteristics and behavior. These characteristic physical properties are lost at different rates depending on the element involved. (For example, the critical cluster size for rhodium is five atoms; for iridium it is nine atoms. Two or more atoms, up to thirty-three, of the same transition group element, when clustered together, are called “metal-metal” bonded. In these cluster sizes, they can not be called truly metallic. It takes a twelve atom cluster before they become electrically conductive. It takes thirteen atoms for their true metallic properties to begin to appear. It takes a cluster of thirty-three atoms before they become fully metallic, and will grow all by themselves. At thirty-three form a “face center cubic”, a first basic growth structure of three dimensions solidly formed like a cube. In all these quasi metallic and fully metallic states, the atoms interact in three dimensions. In the monoatomic state, they are referred to as non-metallic and they interact in two dimensions. In the monoatomic state, these elements have unique and consistent behavior. This is their true elemental state. In the monoatomic state, the atoms of the transition group elements lose their chemical reactivity and change the configuration of the nucleus. This change in nuclear configuration seems to cause the electrical change that pacifies the chemical effect. It may be considered as the mono-atom internally compensating for the highly reactive chemical state. The nuclear configuration changes because there is a correlation between the nuclear orbitals and the electron orbitals as to how full they are. In the nucleus, totally filled orbitals (harmonic) exclude the partially filled orbitals (anharmonic) by pushing them away. The nucleus almost divides into one filled, and one half filled. This is known as the “liquid drop” theory. This condition is unique to these atoms. The newly shaped nucleus is called “superdeformed”. Nuclear physicists have recently confirmed that these atoms will change their proton and neutron configurations when they have no nearest neighbor to di-pole and di-pole react with. They can observe one atom at a time in linear accelerators. A normal nucleus is shaped non spherically (deformed) at a vertical (length) to horizontal (width) ratio of 1.3 to 1. It is very stable and is held together by the strong force. It takes one million electron volts to knock a proton out of the nucleus! Researchers working with large magnetic fields discovered in the 1960’s that metals when induced into a high spin state (using energies of approximately 540,000 gauss) were capable of passing energy from one high spin atom to the next with no net loss of energy! This was the discovery of superconductivity. Superconductivity allows the conduction of energy through a resonance phenomenon. Unlike electrical conduction, energy can be passed from one superconductor to another with contact, without resistance and, therefore, with no net loss of energy. Atoms could now be induced into a high spin state of low energy and be kept in that state without continuous applied energy boosts. The system currently in use, to induce atoms into a high spin state of low energy, is refrigeration combined with extremely high magnetic fields of approximately 540,000 gauss. The system now in use, to keep the atoms in the high spin state, is refrigeration to near absolute zero. All of this is an elaborate and expensive process. There are distinct differences between superconductors. A Type I superconductor is what we refer to as a perfect superconductor, with one single vibrational phase. A Type II superconductor contains ordinary metallic conductivity in conjunction with perfect superconductivity, two or more vibrational phases, and includes the many different systems in current use today. A transition group element in the monoatomic state is a Type I superconductor. It is unique in that it can be found to exist naturally and in a stable state, or it can be reduced from a full metallic state to this state by proper manipulation. Furthermore, once in the monoatomic state, it does not require any outside assistance to maintain its superconductive properties, It is superconductive at room temperatures. Perfect superconductivity is allowed due to a phenomenon known as “Cooper Pairing” which creates a “Meisner Field”. Researchers have theorized that when the nucleus of a transition group element is superdeformed and in the high spin state, a positive “screening potential” around the nucleus (the positive field produced by the nucleus that screens all but the valence electrons) expands out and covers all of the electrons of the element. This screening of all of the electrons allows them to become uniquely paired as mirror images of each other, with spin up and spin down, and without annihilating each other. Instead, in pairing they become, photons of one frequency. As photons, they lose their particle aspect. These are called “Cooper pairs”. A Nobel prize was given to Bardeen, Cooper and Schreiffer for having identified this pairing mechanism. However, this was theory only, and the researchers are not yet aware of the actual existence of this condition in the mono-atoms of the transition group elements nor of the perfect superconductivity of these atoms in this state. Superconductive flow is made possible by Cooper pairs made up of photons flowing on the quantal (phonon) wave of the superconductor. This occurs at room temperature!! When the screening potential occurs, each atom produces a Coulomb wave in two dimensions as it resonates. The phenomenon of the screening potential, associated with a single atom, can also be observed when many single atoms are proximate to each other, but not nearest neighbors, i.e., the atoms must remain monoatomic, and their relation to each other must allow the two dimensional resonance to continue. Instead of absorbing the external applied magnetic field, the atoms near the resonating mono-atom producing the Coulomb wave in two dimensions, will now “respond” to it by nestling in a resonance wave (at distances greater than four angstroms) and the wave will perpetuate, from one atom to the next, ad infinitum, creating more and more Cooper pairs or photons (flowing light) within the sample. The system of the many atoms actually has the same physics as that of a single atom. What is unique about the transition group elements in this state is that the Meisner field, once created, will not cease its response even if the external magnetic field is withdrawn. Instead, the photons will continue to be created and the wave flow will continue to flow. Now the superconductor is apparently superconducting on its own. To resume, the transition group elements with their superdeformed “soft” nuclei all resonating to a single frequency, in their high spin low energy state, becoming a wave flow of light in a resonant unified entity, are a resonance coupled system of quantum oscillators, harmonically coupled in two dimensions. Once the Meisner field is activated, the transition group elements are unique in that they become a “quantal wave”. Energy now flows on a quantal wave perpetually. This effect is believed by Andre Sacharov, Harold Putoff and others to be caused by a universal energy , called Zero Point Vacuum Energy ( Super Light , Ether, Tachyons). It is the natural free energy of the vacuum which is the stimulus, which acts as a natural applied external magnetic field, and makes it possible for these, and only these, natural perfect superconductors to respond as they do. We now have individual atoms running in perfect unison with each other producing a quantal wave upon which energy can flow as long as the atom can derive its energy from the vacuum. Therefore, it is no longer necessary for a manmade system to keep the flow alive, i.e., in a superconductive state. When two atoms or more are perfectly superconducting, they resonance-connect and expel external magnetic fields. However, there is a limit to a superconductor’s capability to exclude external magnetic fields. This is referred to as HC 2. If that amount of magnetic field is applied to the sample, all resonance coupling collapses. This phenomenon is utilized as an electronic switch, called a Josephson Junction. Applying sufficient external magnetic field will stop the flow of energy in the superconducting system and switch it off. Releasing the external magnetic field will turn the switch is on. Being able to use Josephson’s Junctions for superconductive devices at room temperature will be extremely valuable. When analyzing these transition group elements in the monoatomic high spin state by standard spectroscopic analysis (which is based on reading the characteristic emission or absorption of the energy caused by knocking the electrons from one location to another in the atom), the analysis becomes impossible because the atom no longer has individual electrons, only Cooper pairs. The electrons have paired to become photons and no longer exist in “space-time” or at any specific location as particles; they are waves of light. Therefore, the monoatomic elements remain “hidden”. When analyzing the atoms in these elements in the monoatomic high spin state by X-ray spectroscopy, they still can not be seen, even if they are aggregated by taking them to a low spin state and forming metal-metal bonds. The dimensions between the atoms range from 1.8 to 2.2 angstroms. To be seen by X-ray, their overall dimensions must be fifteen angstroms or larger to match the fifteen angstrom wave length of the ray, so that the ray can strike the particle twice for it to be seen. This would take approximately thirty atom clusters in three dimensions. Mono-atoms are, therefore, X-ray amorphous. In order to identify the transition group elements in the sample, Hudson prepared the sample into a metal-metal bonded state, just sufficiently “metallic” to be read by the Russian system of spectroscopy developed at the Soviet Academy of Sciences. Standard spectroscopy requires a more fully metallic state in three dimensions before the elements will read. Hudson discovered that the precious elements, in the group of transitional elements, could be found in a monoatomic form in certain ores and that by a chemical method, he could separate them out from these ores. The high spin low energy state is stable and naturally maintained. it needs no external manmade manipulation. The internal temperature of the atom is measured to be almost zero degrees Kelvin . (approximately three degrees). This is a naturally cold state. It is, in fact, a perfect superconductor. Hudson also discovered that he could prepare these mono-atoms from commercial metallic forms of the transitional group elements as well, and maintain them in this state by removing the chemical and crystalline energy. This is achieved by providing another element that is highly reactive and which has a chemical affinity for the transition element. When they react, they form a compound of the two elements. Through a process of replacement chemistry, hydrogen is exchanged for the reactive metal. The hydrogen transition metal compound is chemically removed from the solution and the hydrogen is thermally annealed from the sample. It is inherent in these precious elements to convert to the high spin state if this particular sequence is followed. This process is permanent and does not have to be continuously applied. It is also infinitely less expensive than the traditional refrigeration process. Hudson’s material can be considered as literally billions of atomic Josephson Junctions. Hudson’s discovery provides superconductivity at room temperature and is extremely valuable in all electronic and power applications. In Hudson’s early research, before he realized the value of the monoatomic high spin state, he attempted to force mono-atoms to the low spin state by the application of extremely high energy in order to make metal out of the mono-atoms. Using an arc furnace (a water cooled copper crucible with a tungsten electrode mounted above it and all atmosphere controlled) and an argon gas as the plasma gas, Hudson struck an arc on the sample and within one second, totally destroyed the tungsten electrode. Estimations of the heat (BTUs) being generated far exceeded any chemical energy possible. Hudson was sufficiently concerned that since 1982 he has not attempted to reproduce the procedure. He suspected a nuclear level energy release to be causing the phenomena. In 1991, Hudson found an article in Scientific American in which Berkeley Brookhaven had observed that superdeformed high spin atoms, when subjected to external magnetic fields sufficient to affect the nuclear quadripole moment, would cause the nucleus to emit gamma radiation without fissioning. The research physicists doing the testing at Berkeley Brookhaven was amazed at their findings. They had indeed confirmed Hudson’s suspicions about his material. Without the use of linear accelerators, nuclear level gamma emission can be induced to emit from the ORMEs in Hudsons material with the simple application of a DC arc. This discovery has tremendous energy production capabilities. When Hudson became aware that the precious elements in this superdeformed high spin state could not be analyzed by standard instrumental analysis, he realized that they could exist everywhere undetected. There are many published papers where superconductivity has been observed in biological systems. However, no-one has yet understood where the superconductivity is originating. Using the Russian system of spectroscopy, analyzed pigs’ and calves brains and discovered that an excess of five percent by dry matter weight of the tissue was rhodium and iridiumin the high spin state. Hudson suspects that the human body also contains quantities of these elements in the monoatomic state. Nitric oxide is a compound that dramatically pins these elements (causes the high spin atoms to go to the low spin state). The air contains normally about one percent nitric oxide. Every breath of air provides nitric oxide which “kills” the high spin state of these atoms in the body. In performing this chemistry, nitric oxide causes the screening potential of these atoms to withdraw and removes one of the Cooper paired electrons which comes under the control of the nitrogen atom. When this occurs, the electron is annihilated along with one of the nitrogen electrons, and produces a one million electron volt photon (gamma level radiation), which is absorbed by the nucleus of the nitrogen atom. In as much as we can not remove nitric oxide from the air, the detrimental effects can be offset by adding more of these precious elements in the superdeformed high spin state to our diet. Recently there have been articles in the medical literature indicating the emerging value of precious metal salts for anti-tumor activity. However, the researchers are unaware of the reason the beneficial effect. Hudson believes it is due to the change in the physical condition of the salts that occurs in the aqueous saline solutions in the body. If the cluster of atoms in the salts is sufficiently small, they can dissolve to the monoatomic state. Hudson believes that these elements in their monoatomic state correct DNA and are, in fact, the “light of life”. His research into this use of monoatomic rhodium and iridium is ongoing. To date, they are showing to have enormously beneficial results with terminal Aids and cancer patients. Copper is used today in Type II superconductors, in the form of yttrium barium copper oxide. It is indeed a high temperature superconductor, but in order to maintain its monoatomic state at room temperature, it needs the matrix of yttrium http://www.chemicalelements.com/elements/y.html , barium http://www.hbci.com/~wenonah/hydro/ba.htm and oxide to keep its atoms at the requisite distance from each other and to function in two dimensions. Other wise it will form metal-metal bonds, become increasingly metallic and lose its superconductive behavior. We have Named each “Atomic Form”, that has Stable, Useful, Properties. There are 98 Atomic Forms, that occur Naturally, with some abundance. Our Natural Planetary Family of Atomic Forms, Join Together in various Dances, to make Many Billions of Different Molecules. Our Whole 3-D World, is Really, One Big Dance of Atomic Forms, All Constantly Moving in Patterns and Rhythms. Metallic Elements in general are distinguished from the non-metallic elements by their lustre, malleability, conductivity and usual ability to form positive ions.